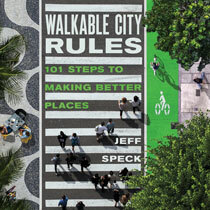 Jeff Speck is a city planner and urban designer who, through writing, lectures, and built work, advocates internationally for more walkable cities. As Director of Design at the National Endowment for the Arts, he oversaw the Mayors' Institute on City Design and created the Governors' Institute on Community Design. Prior to joining the endowment, Speck spent ten years as Director of Town Planning at Duany Plater-Zyberk and Co. He is author of Walkable City: How Downtown Can Save America, One Step at a Time and the co-author of Suburban Nation: The Rise of Sprawl and the Decline of the American Dream as well as The Smart Growth Manual.